Who is, “Joyce Jackson”? Tell us a little about yourself. I like to be known as an artist, even though in some ways, I appreciate the idea of not attaching labels to people. I create in a variety of media. For several years, beginning in the 1970’s, I concentrated on pottery and fine clay art. But I’ve always been involved in 2-D art. I was artistic throughout my childhood. I used to spend days in my parents’ driveway in a rural, sparsely populated New York State town, building cities from the driveway dirt. I had to start over from scratch every time my Mom came home and drove over my cities with her car, but I just took it back up from where I left off before the last destruction. That’s sort of a metaphor for how my creative activities have taken shape. An amusing mixture of destruction and rebuilding. My parents weren’t artists. All through my youth, they were under so much strain financially and health-wise that there was no room in their lives for art appreciation. My Dad never encouraged any of his 3 daughters to pursue art. My mother thought making art was a big waste of anyone’s time. I smile a bit when I think to myself that at least they were impartial in their dislike. I’m thankful that in spite of this, they allowed me the freedom to make my own choices. Many changes came about in my later life that led to my adult artistic career/pastime. I always felt suffocated trying to work at a regular job just to get money. It was always acutely painful how joyless it was. Nothing else gave me the fulfillment that creating did. I can’t recall how I found out about it. I decided to follow through on the intention to join that I had held onto for a long time before acting on it. That’s because I was working on paintings very slowly. I wasn’t yet in synch with EV’s monthly deadlines. I’ve gradually become more relaxed about some things that used to be stressful to me. Now I find myself wanting to be challenged to finish artwork faster, have it viewed by more people, and offer it for sale. It’s not only about making sales. It’s much more than just that. But by the same token, I deeply appreciate the sales when they come. I don’t want to be too pre-occupied with finances or so distracted by them that the work itself is compromised. I often find that striking the right balance can be tricky. I’ve been enjoying being a part of EV immensely. I’m so very proud and thankful to have been voted in unanimously by the EV board. That was a significant milestone for me which offsets some of the sadder stages of my life so greatly, I can’t even express in words what it means to me. If people only knew how challenged I was during the darkest moments of my life, especially my childhood – but that’s not a subject I care to go into here. The first month I created for EV – I think it was May, 2014 – I had to concentrate on finishing the piece to the exclusion of all else. Gradually, I’ve begun to find ways to streamline my creative process. At times, I still want to just slow it down a bit, but on the whole, I’m finding this to be a refreshing change of pace for me. I want to start by inviting viewers to make their own interpretations if they have ones that are more personally meaningful to them. That’s how it should be. For those looking for ideas as a starting point, here goes. 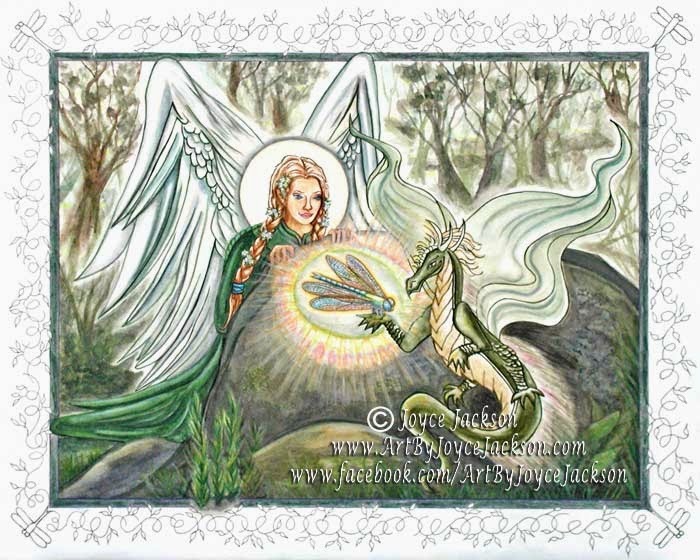 The wonder of a species (dragon) beholding its counterpart (dragonfly) as a separate species. An event that triggers innocent perception. The angelic girl as a witness to the encounter adds a human element. 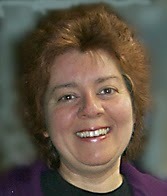 I read in a book by Glenda Green that artists retain the innocent perception that most people lose in their childhood. I like that idea a lot. I chose this even though it might not be the most popular by some standards. It has special meaning to me. This is about the power of silence behind everything the ego mind covers up. The place described by many different bodies of spiritual knowledge which try to express in words a thing that can’t be verbalized, only experienced. The Sahasrara, I learned when I was in India for spiritual reasons in 2013, is the crown chakra. I was told that when it’s fully activated, we reach one of the levels of God realization. A native woman and her power animals in natural surroundings is something I gravitate to easily. The beauty of her being connects us to our origins, our oneness with the forces of nature. I also drew upon a sense of the way the forces of nature invoke a peaceful stillness in us like nothing else can. Ever since I became interested in them, I’ve enjoyed the fact that I was born in the city after which Herkimer quartz crystals were named, Herkimer, NY. This celebrates the way crystals are a special treasure gifted to me at birth. Their mysterious qualities are hidden. They will only be revealed if we know how to find them. 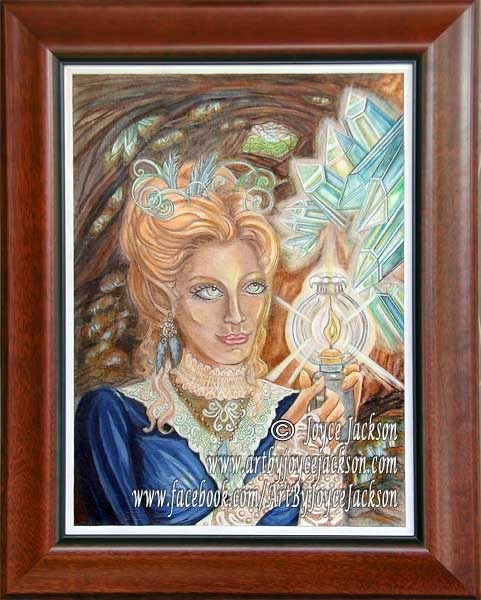 Maybe the crystals in the painting are more like beryl crystals than the Herkimer quartz variety. It doesn’t make any difference to me. I just chose those colors because I like them very much. The image for this painting that first came to me before I started on it “strongly wished” that its colors be blue-greens and burnt sienna. The elfish woman in Victorian era garb was a nod to a Steampunk theme EV’s auction partner set for that month. Yes, I just started recently this year. Thanks to everyone who participates at all levels, and especially the admin(s). I enjoy the exposure and the opportunity to sell my artwork to an appreciative audience. I get many additional visits to my website and Facebook page due to its existence. Honestly, the artists I’ve interacted with in the short time I’ve been with this group have the kind of humility that is special to great individuals. They are kind and supportive. I feel so fortunate to be considered one of their colleagues and am very thankful. Their artwork energizes and inspires me. It takes a certain degree of maturity, personal integrity, and security to carry on the way everyone does. All of the EV artists I’ve been meeting up with definitely have the stuff it takes to face and accept this type of challenge with flair. They’ve been great role models for me. I have Crystal Kingdom on a wall in my sacred room. The white, blue, blue-green, and purple colors in it are very healing for me. Every once in a while, I just stop to rest my mind, doing nothing else but dreamily gazing at anything that inspires me. It could be this painting, but also crystals, trees, other objects of nature, my cats, artwork, or even anything normally considered mundane. I believe that it somehow recharges my creative drive. I have a nice sun room that gives me great light. It’s not energy efficient. 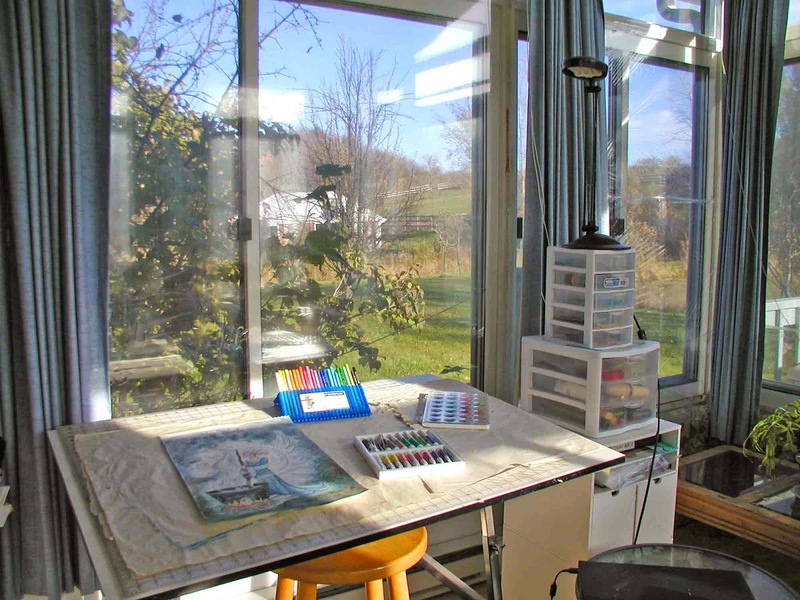 My hubby and I want to work on making use of the sun’s energy for heating it in winter. We want to create a Do-It-Yourself solar collector with air ducts and a fan that will blow the heat into the room, possibly other rooms in the house. OK, but some are made up because I couldn’t come up with one word. Thank you so much Joyce for this wonderful look into your creative process, your art and you. 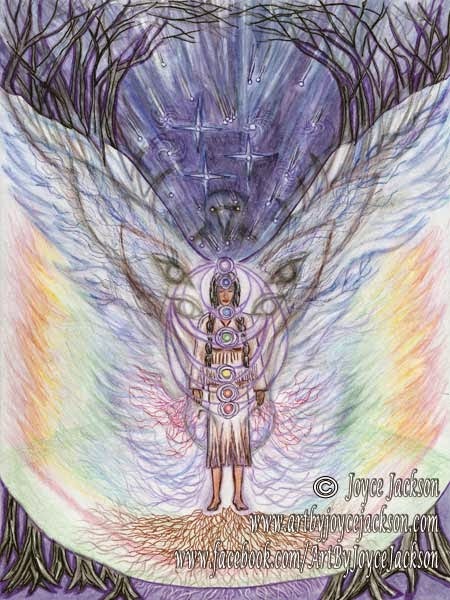 Please visit ENCHANTED VISIONS to see more of Joyce’s art and what she has created for the latest theme. 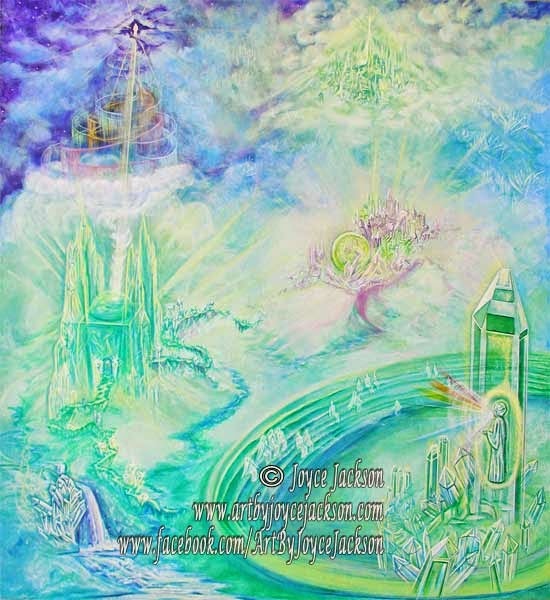 Posted in artist feature, artist interview, Enchanted Visions, Friday Art Feature and tagged fantasy art, Joyce Jackson.